Get a pot of water boiling on the stove for your pasta. Go ahead and put the olive oil in a skillet to cook your scallops. 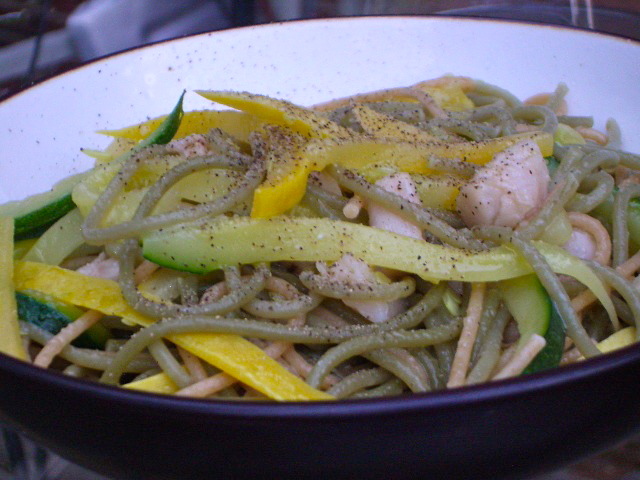 While the water is getting to a boil, cut your squash and zucchini into long, thin strips, emulating pasta. Once the water reaches a boil, add the spaghetti. Go ahead and put medium heat under the skillet with the olive oil. After the spaghetti has been cooking for five minutes, add your scallops to the olive oil skillet. After these have cooked for 2 minutes, add the squash and zucchini to the boiling water. After these have cooked for 3 minutes (and/or the pasta is done), drain the pasta/squash. Drain the scallops over the pasta, and toss together. Divide into bowls and top it with either citrus infused olive oil or lemon juice and olive oil. Crack some sea salt and black pepper on the top and ENJOY!